___ It’s a tempting vision: using your existing design skills to make a bit of extra cash by branching out into your own line of unique merchandise. What could be easier than getting a few T-shirts printed up and putting them on your website to sell? The answer, according to Stereohype co-founder Tomi Vollauschek, is nothing, so long as you’re prepared to become "your own PR machinery, project manager, sales rep, investor, client, accountant, intern, courier, and so on... Oh, and last but not least, an editor, designer, illustrator and artist." ___ Nevertheless, it seems that everyone is at it these days, and many of them will have been inspired by the success of ventures such as Stereohype. Since launching in 2004, the London-based online store founded by Vollauschek and Agathe Jacquillat has splashed both the duo’s own and a host of guest artists’ designs across exclusive ranges of T-shirts and badges, as well as stocking prints, books and many other items. In 2009, the pair also authored Made & Sold, a book showcasing more than 500 self-initiated products created by designers-all whilst still running their visual communication studio, FL@33. ...items, badges, sew-on patches, pocket mirrors, mugs, magnets, stationery sets-if you can picture it, then chances are that there’s someone out there waiting to help you produce it. ___ For T-shirts, the first step is to source the shirts themselves. Buying the cheapest possible blank tees might seem like an attractive option, but many designers prefer their work to appear on higher-quality, sweatshop-free garments from brands such as American Apparel. One such label is No Guts No Glory, an Exeter-based collective run by Nathan Blaker and Hayley Marchant. Designed by a hand-picked selection of artists, its tees are printed onto organic cotton shirts from Anvil, a US company with an environmentally and ethically responsible ethos. "The super-soft organic T-shirts and jumpers that we use are a little more expensive to source than conventional cotton garments, but the quality is far superior," Marchant explains. ___ No Guts No Glory’s designs are hand-screenprinted by Get A Grip, an independent studio based in Birmingham’s Custard Factory that specialises in using organic inks. "We love analogue printing techniques, and a lot of our favourite artwork lends itself very well to screen printing," Blaker says. "It’s also friendlier to the environment, and the finish and longevity of the printed garments are noticeably better than with other printing methods. Hand printing also ensures that every single garment is checked for quality." ___ Seems straightforward? Agathe Jacquillat offers a note of caution: "The main headache in producing T-shirts is the issue of sizes," she says. "There doesn’t seem to be a rule in what our customers prefer. When we initially sold out quickly in medium and large sizes and then ordered accordingly the next time around, suddenly everybody wanted small and extra-large." In her view, this unpredictability is another reason why you should make sure that all your products are desirable. "Individual tastes are sooo varied-it’s mind-boggling really. It doesn’t even have anything to do with the customers’ location and culture; everything sells eventually. It’s all about creating a brand and making sure it’s all of highest quality." 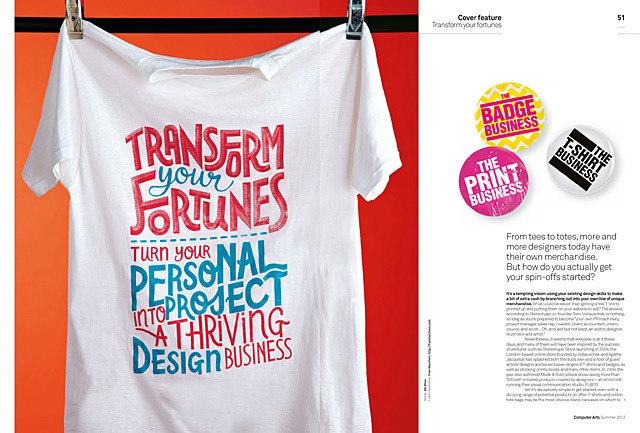 ___ The simplicity, low costs and DIY potential of badges make them another attractive spin-off item. A professional hand-operated badge-making machine and starter kit from a company such as Enterprise will set you back about £150 new, but if you anticipate producing any significant quantities, you may want to consider ordering them from a manufacturer-your arm muscles will certainly thank you for it. Birmingham illustrator and comics artist Lizz Lunney has a thriving sideline in badges: she recommends requesting samples from a range of online suppliers so that you can judge the quality. "Generally once I’ve found a good supplier I will only use them for any particular product; it’s good to be a loyal customer because they are then prepared to rush orders or help with things when required," she says. Using a supplier doesn’t commit you to massive quantities, either: "I started by ordering less than 50 of each and overtime it’s easy to see which designs are the best sellers. 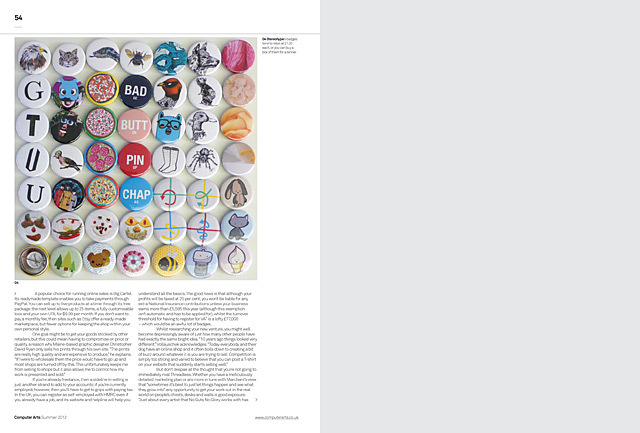 I usually get badges in batches of 1,000 now." ___ When it comes to actually selling your items, a simple website with clear photos of the products can often be all that you need. No Guts No Glory is soon to launch a new site to reflect its growth, but Blaker admits that the label’s initial one, built by a friend, was pretty basic. "At the time it totally suited our needs-we only had two types of products to display, and a blog page was helpful in giving us a voice." He adds, "We take care of everything on the website, from photographing ourselves wearing the T-shirts, uploading them to the online shop and tracking the stock levels. Packing up orders can take a fair amount of time, but it’s much easier if it’s all done at once, so we set aside time each day to get them ready." ___ A popular choice for running online sales is Big Cartel. Its readymade template enables you to take payments through PayPal. You can sell up to five products at a time through its free package; the next level allows up to 25 items, a fully customisable look and your own URL for $9.99 per month. If you don’t want to pay a monthly fee, then sites such as Etsy offer a ready-made marketplace, but fewer options for keeping the shop within your own personal style. ___ One goal might be to get your goods stocked by other retailers, but this could mean having to compromise on price or quality, a reason why Maine-based graphic designer Christopher David Ryan only sells his prints through his own site. "The prints are really high quality and are expensive to produce," he explains. "If I were to wholesale them the price would have to go up and most shops are turned off by this. This unfortunately keeps me from selling to shops but it also allows me to control how my work is presented and sold." ___ If you’re already freelance, then a sideline in selling is just another strand to add to your accounts; if you’re currently employed, however, then you’ll have to get to grips with paying tax. In the UK, you can register as self-employed with HMRC even if you already have a job, and its website and helpline will help you understand all the basics. The good news is that although your profits will be taxed at 20 per cent, you won’t be liable for any extra National Insurance contributions unless your business earns more than £5,595 this year (although this exemption isn’t automatic and has to be applied for), whilst the turnover threshold for having to register for VAT is a lofty £77,000-which would be an awful lot of badges. ___ Whilst researching your new venture, you might well become depressingly aware of just how many other people have had exactly the same bright idea. "10 years ago things looked very different," Vollauschek acknowledges. "Today everybody and their dog have an online shop and it often boils down to creating a bit of buzz around whatever it is you are trying to sell. Competition is simply too strong and varied to believe that you can post a T-shirt on your website that suddenly starts selling well." ___ But don’t despair at the thought that you’re not going to immediately rival Threadless. Whether you have a meticulously detailed marketing plan or are more in tune with Marchant’s view that "sometimes it’s best to just let things happen and see what they grow into", any opportunity to get your work out in the real world on people’s chests, desks and walls is good exposure. "Just about every artist that No Guts No Glory works with has received further commissioned work directly from a T-shirt that they have designed for us," she says. "Jack Teagle in particular picked up a job designing the logo for a Malaysian television channel directly as a result of a T-shirt that he’d designed being sold to someone who worked for the station." ___ In terms of how willing you are to balance your project with your existing work commitments, not everyone may have the nerve of Blaker, who, despite having no previous business experience, tackled the recession head-on by opening No Guts No Glory’s shop premises in 2009. "We have put certain projects, be it personal or commissioned work, on hold for the time being to focus all of our energy on turning the ideas that No Guts No Glory provides us with into reality," he says. "It can be so time consuming running the project every day, but it’s also so exciting when you get to put an idea into action." 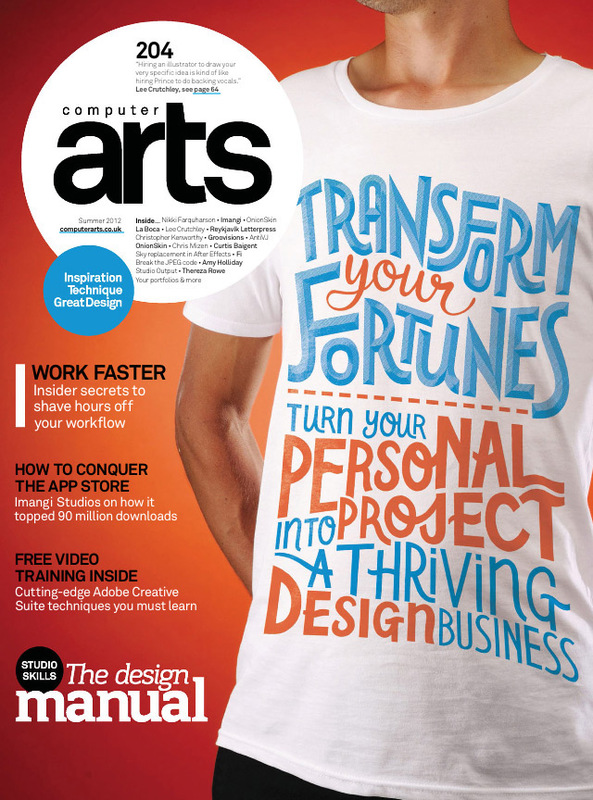 ___ For most designers, however, starting a merchandise sideline is no easy ticket to giving up the day job. Even though his print business has grown steadily since he founded it in 2004, Ryan stresses that it’s some distance away from being his main Living: "It’s a sideline. I have prints made on demand so I don’t sit on a lot of inventory." Compiling Made & Sold, meanwhile, has given Stereohype a realistic view of what such activities can achieve financially. "In many cases-and this might come as a disappointment to the profit-orientated – it’s not about the quick buck," Vollauschek says. For him, the rewards come from having a creative outlet to distract from the pressures of day-to-day client work. "Think of it as an expensive hobby and a kind of therapy and creative playground. If you happen to find the right formula and have a bit of luck you might end up making a little money every now and then." 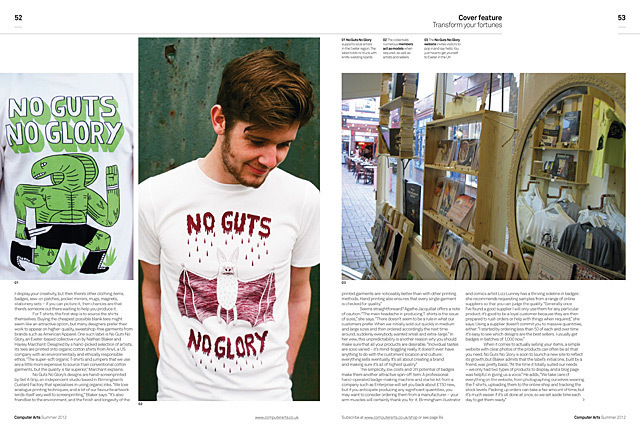 |01| No Guts No Glory supports local artists in the Exeter region. The label holds no truck with knife-wielding lizards. |02| The collective’s numerous members act as models when required, as well as artists and sellers. |03| The No Guts No Glory website invites visitors to pop in and say hello. You just have to get yourself to Exeter in the UK. |04| Stereohype’s badges tend to retail at £1.50 each, or you can buy a box of them for a tenner. 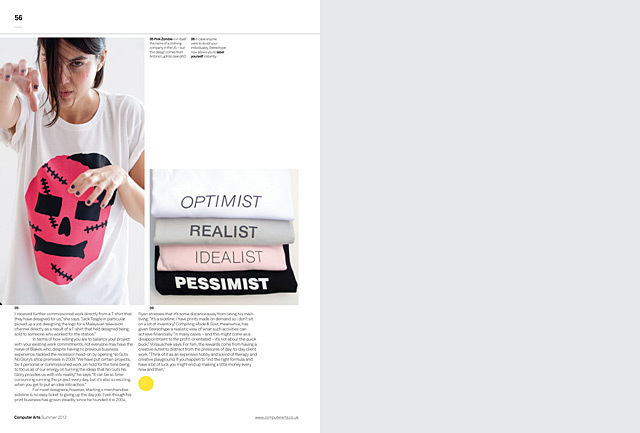 |05| PinkZombie is in itself the name of a clothing company in the US – but this design comes from Antonio Ladrillo (see p.60). |06| In case anyone were to doubt your individuality, Stereohype now allows you to label yourself instantly. August 1st, 2012 — FL@33 / Stereohype interview excerpts and products featured in cover story of current Computer Arts magazine – Summer 2012 issue #204.